Spend a weekend discovering the secrets of truffles under the guidance of a French master chef. Arrive in Avignon by high speed train early this morning, transferring directly to La Mirande, a gorgeous small hotel housed in a 14th-century cardinal’s palace behind a Baroque façade. 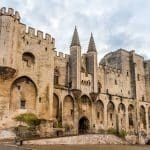 The hotel is situated opposite the Palais des Papes (Palace of the Popes) and surrounded by the ancient city ramparts of Avignon, built to keep the plague and invaders at bay during the turbulent middle ages. A buffet breakfast will be available upon arrival. Meet your guide at 10:00am, departing for a full day’s truffle hunting excursion. Begin with a visit to the Viguier Farm near the Mont Ventoux to discover the secrets of truffles, the black diamond of French cuisine. From here you will set out on a truffle-hunting expedition with specially trained truffle dogs. This afternoon enjoy a truffle tasting along with a leisurely gourmet lunch at the farm. Return to La Mirande by 6:00pm. You will have time to relax and enjoy the beautifully decorated interiors before dinner on your own this evening. We suggest dining at the hotel’s Michelin-starred restaurant, where sophisticated and lovingly-concocted dishes revolve around traditional products grown in their native soil. Begin today with an organic buffet breakfast in the Salon Louis XV overlooking the peaceful La Mirande garden and the Palais des Papes. Your cooking class with La Mirande’s celebrated chefs begins at 9:30am. Meet beside the wood-burning stove in the 19th-century kitchen to prepare a complete truffle menu. Pay tribute to this fabulous fungus under the guidance of Master Chef François Secretin. Learn to dress dishes with black truffles and bring home the secrets for making the most of their heady, unique aromas. Break for lunch at 12:30 pm. You will enjoy a tasting of the truffle menu prepared this morning accompanied by a selection of prestigious Rhone Valley wines. The remainder of the afternoon is at leisure. 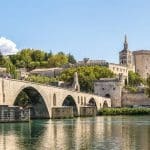 Wander out on your own to explore the elegant, cosmopolitan and historically fascinating city of Avignon. 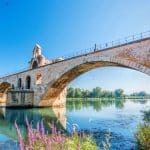 In addition to the immense Palais des Papes, you’ll find the 12th-century Cathédrale Notre-Dame-des-Doms and the Petit Palais with its stunning collection of early-Renaissance Italian paintings. Walk to Rocher des Domes (Rock of the Domes), the hilltop garden looking down upon the rooftops of Avignon, the surrounding towns and the Rhône. End your day in the Place de l’Horlage, the bustling city square which houses the Hotel de Ville (City Hall with a clock tower), the city’s opera house, and the Maison du Jean Vilar Museum located in the former home of the founder of Avignon’s famous theater festival. The lively square is filled with cafes, street vendors, portrait artists and cartoonists, and boasts a lovely old-fashioned carousel. Dine on your own this evening. Return to your hotel or choose from a list of suggested restaurants nearby. This morning enjoy your final breakfast in the Salon Louis XV or in your room. If time permits, visit the Place Pie on your own. The daily covered market here sells fresh produce, cheeses, wines, and other produits du pays (Open 6:00 am – 1:00 pm). Transfer to the train station or airport by private car in time for your departure or continue on to your next Willing Foot destination. Get in touch to design your dream trip. Willing Foot travelers are savvy, sophisticated and adventurous, looking for unique, interesting experiences.